I’ve done Standards Based Grading in Calculus for two years now. This is the start of my third year. One of the things I have my kids do at the end of each school year (not just in calculus, but in all my classes) is to write a letter to themselves. But in the past. Yes, I tell kids to compose a letter that can be sent back into time, to them, at the beginning of the year. Things they wish they had known at the start of the year that they know now that it is the end of the year. And I let them know whatever they write is up to them, and that I don’t look at this until way into the summer. We seal them up. I usually share these letters with kids the following year. When I do, I ask kids to think about commonalities they noticed in the advice from students, and also, if anything struck them. We have a conversation about that. I definitely emphasize that what works for one person might not work for another. Without further ado, here is the advice that my 2011-2012 calculus kids wrote to their past selves, which I will be sharing with my 2012-2013 calculus kids. To me, the major commonalities are… advice to do their homework even though it’s not graded, not to use reassessments as a crutch because it’s to your benefit to learn things the first time around, and to ask for help from colleagues and Mr. Shah. With that, I’m out like a light. I gave my kids a google form to fill out with their thoughts on Standards Based Grading this year in calculus. My instinct is to interpret them for you before presenting them, but I’ll hold off. For context, I teach at an independent school where most kids are motivated to do well, partly because of internal motivation and partly because of grades for college. I teach the non-AP calculus course, which means I get a wide variety of students… from those who really really don’t like math but feel they need calculus on their transcripts to those who kinda like math (and maybe a few who really like math, but those are the exception). My calculus classes have on average 12 students in them. The students at my school do learn to speak up for themselves, so I think for the most part, the comments are probably fairly accurate representations of what they are thinking. First, I asked what they felt about the grading system after the 1st quarter, and after the 3rd quarter. Then I asked about what they took away from it. Finally I asked for what they had to do differently in this class than in others, whether they think they would have done similarly if they had a traditional grading system, and what they think I should keep and what I should change. … and compared to last year, things went so so so much more smoothly logistically. Writing the reassessments didn’t take as long, I felt the work I was putting in was paying off. In any case, I could analyze things, but I’ve already done that in my mind. My conclusion: although not perfect, this was a wildly successful year for Standards Based Grading in calculus. Calculus is easy. Algebra is hard. In my first three years of teaching calculus, I started with how all the books started, and all my calculus teacher friends started: a precalculus review. Then we went into limits. The problem with that is that we might review some basic trigonometry, and then we wouldn’t see it again for months. And by then, they had forgotten it. And who could blame them. The precalculus review unit at the beginning of the course wasn’t working. As I transitioned into Standards Based Grading, I looked at everything I taught really closely, and I honed in on the particular skills/concepts I was going to be testing. And since I’d taught calculus for a number of years prior, I knew exactly where the algebra sticking points were. Thus was born The Algebra Bootcamp. Before our first unit on limits, I carefully analyzed what things I needed students to know to understand limits to the depth I required. 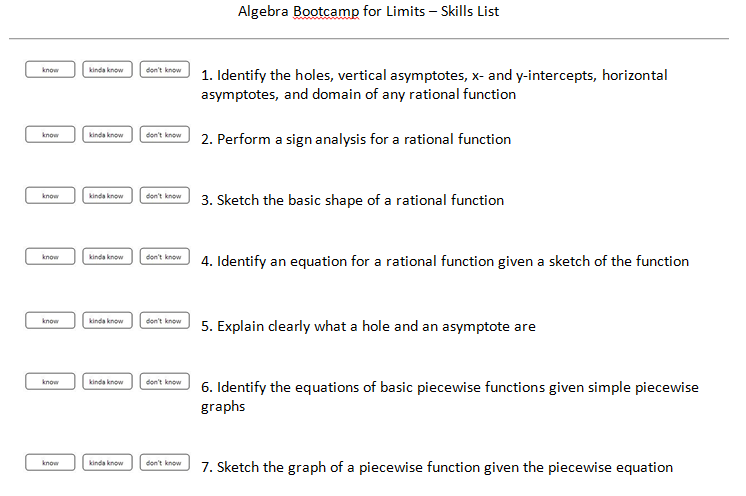 I then looked at all the skills and thought of all the algebraic things, and all the old concepts, they would need in order to understand limits. 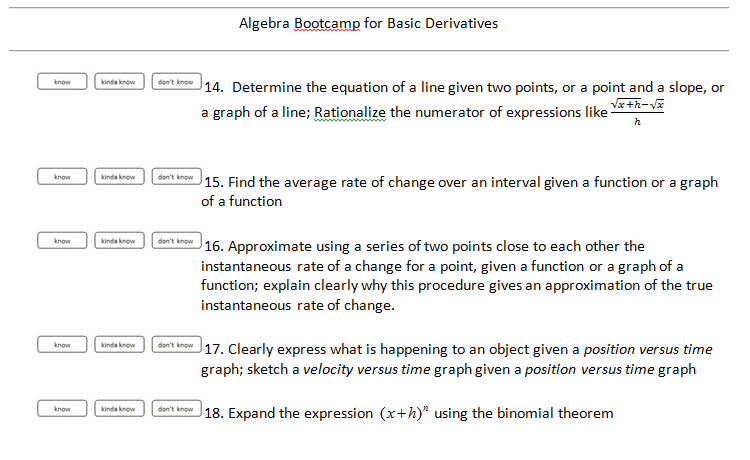 And from that, I crafted an algebra bootcamp, and I made SBG skills out of just those limited skills. It is called “bootcamp” because I am not reteaching it from scratch. I’m reviewing it, and I go through things quickly. I only do a few of them in the first quarter and maybe the start of the second quarter. By that point, we’ve done what we needed to do, and they die off. The reason that this has been so effective for me is because students aren’t having to relearn old topics/algebraic skills while concurrently learning the ideas of calculus. We review these very specific things beforehand so that when we approach the calculus topics, the focus is not on the algebraic manipulation or remembering how to find the trig values of special angles or what a piecewise function is… but on the larger picture…. the calculus. Remember: calculus is easy, it’s the algebra which is hard. So we took care of the algebra beforehand, so we can see how easy calculus is. With the exception of for the derivative of . It’s Monday night and the first day of classes is Wednesday. I am teaching only two preps this year — the first time since I started teaching! I have a couple Algebra II classes and a couple Calculus classes. Also for the first time ever, I’m in a single classroom for all of my classes. It’s not a pretty classroom, really, and it is one of two rooms in the entire school with chalkboards (ugh! chalk! ), but it’s mine! And I share it with another math teacher. So go me. The past few days have gotten me to school, doing lots of logistical things. Like making minor revisions to my course expectations (here they are from two years ago, and not too much has changed) and my calculus SBG rubric (a 5-point scale, now, taken almost wholesale from @cheesemonkeysf), and photocopying them. I made a few small changes to how I’m grading in calculus: now 80% of a student’s grade will be their SBG score, and 20% will be projects/problem sets/groupwork. Basically it’s an “other” category which will involve synthesis, problem solving, and less-routine-thinking. Although 20% might not seem like too much, I don’t have all these things lined up (I do plan on doing a lot of Bowman’s activities tho! ), and I didn’t want to overwhelm myself this year by having to create all this new stuff. After much deliberation I decided not to grade homework, even though students last year clamored for it in their evaluations. In Algebra II, the grading will be pretty much the same as in previous years, except we are integrating problem sets into the mix. So we are having 70% formal assessments, 10% binder checks, 10% home enjoyment (“homework”), and 10% problem sets. More about the problem sets as they develop, but I think they’re going to be heavily related to the habits of mind work that the Park School of Baltimore engages in. I honestly think that when their curriculum is finally published (I’ve gotten to see a bunch of it), it’s going to change how so many of us teach. I figure I’d share a few concrete things I plan on doing throughout the year, with my emphasis on formative feedback, growth mindset, and habits of mind. (1) To gauge where students are at, I created these pretty cards which I will use to get feedback and how kids are feeling about the material. So after maybe I have them do a sample problem, or do a think-pair-share, I’ll have ’em throw up a card to lemme know where they’re at — and from that I’ll know whether to move on, whether to switch partners for the remainder of the class (pairing someone who gets it with someone who doesn’t), or something else. (2) But it would be crazy to have these cards, and not make them even more useful. So these are the backs of the same cards. And so I can throw up a multiple choice question on the board, and have kids hold up their answers. Or anything that involves choices. If you’re going to do this, just know you shouldn’t write As on the backs of all the “totes get it” and Bs on the backs of all the “almost there” etc., because you don’t want anyone influenced by what other’s have up. And yes, these were partially inspired by the fantastical Kate Nowak, and I’m really excited about them. 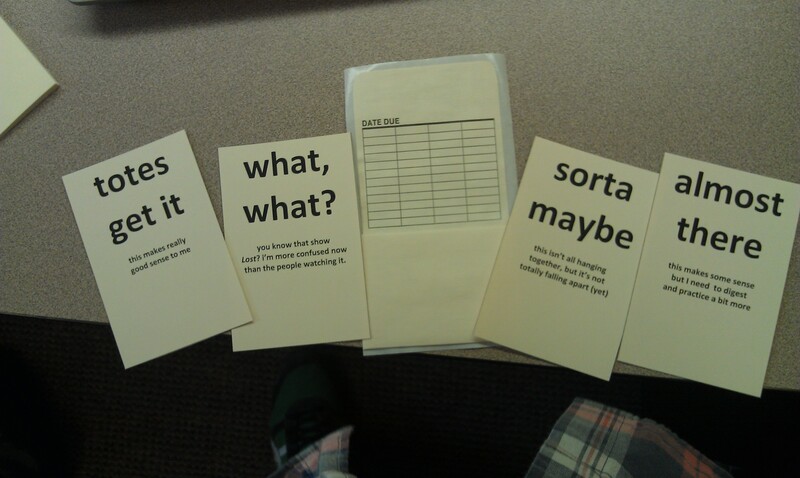 (3) @mythagon has an amazing way to get kids to start talking at the start of class: what’s the question? I can see it being really fun, get kids talking, and amazing for activating prior knowledge. I’m so doing this. (4) Kate Nowak trying to instigate fights in her classroom by using good questions. I am going to try to instigate fights! FIIIIIIGGGGHHTTT! (5) I have miniwhiteboards, but I’ve never really used them except occasionally and poorly in my seventh grade class in my first year of teaching. I want to use them, but want your advice on things that work. I was going to have kids do “check yo’self before you wreck yo’self” questions (math questions directly related to something we covered in class, right after we cover it in class) on them — and hold them up and I can walk around and see where we’re at. But there’s gotta be more and better uses. 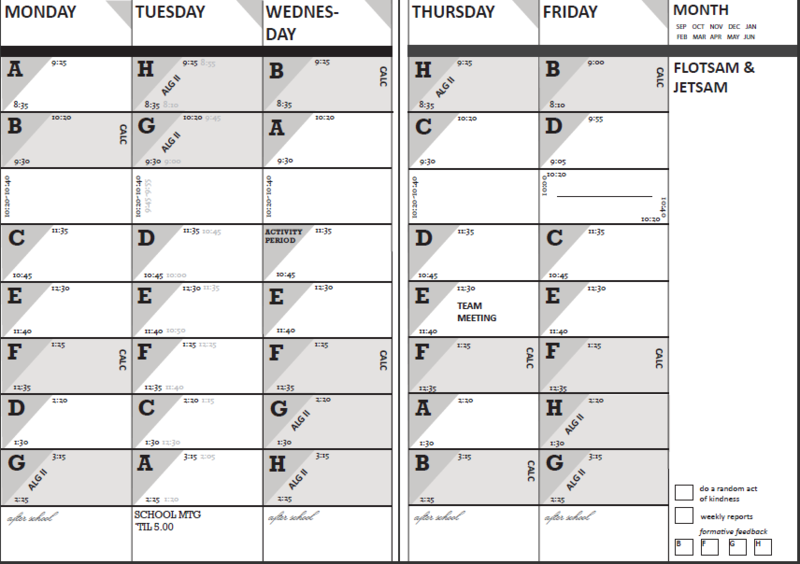 (6) I designed my planner (as I do every year) (and yes it’s beautiful and coveted by many)… and this year because of my emphasis on formative feedback, I made a small checkbox at the bottom which will help me see if at least once a week I either gave kids feedback (non-graded), or if I got (non-graded) feedback from my kids to help see where we go next. (7) I hope to use exit slips this year at least once a week, either to check my kids’ understanding of the material we’ve been learning or to check in on my teaching. One idea I had was to have a coordinate plane, where the x-axis goes from booooring to engaging and the y-axis goes from no idea what’s going on to this is all coming up roses, and having kids mark down where they are. (8) I historically tend not to do a lot of group work. Mainly partner work. This year I’m going to try to get more voices into the mix, and have students do things in 3s and 4s occasionally. But kids don’t know how to work in groups, and what it means to be working together effectively. And that’s because they’re not really taught. Which is why I love the idea of participation quizzes. (9) I hope to put up a short agenda and a goal or two for the day, on the board, everyday. Where we go and what we do shouldn’t be a mystery. I always think it should — we’re unfurling mathematics, and in the unfurling we get the beauty — but that’s not how someone learning the material thinks or how they can organize information. They want a destination and to know how we’re getting there. I get that. When I’m in a class, I want that. I only want things unfurling in very special cases. That’s about all I got for ya now. More to come as the year gets underway. 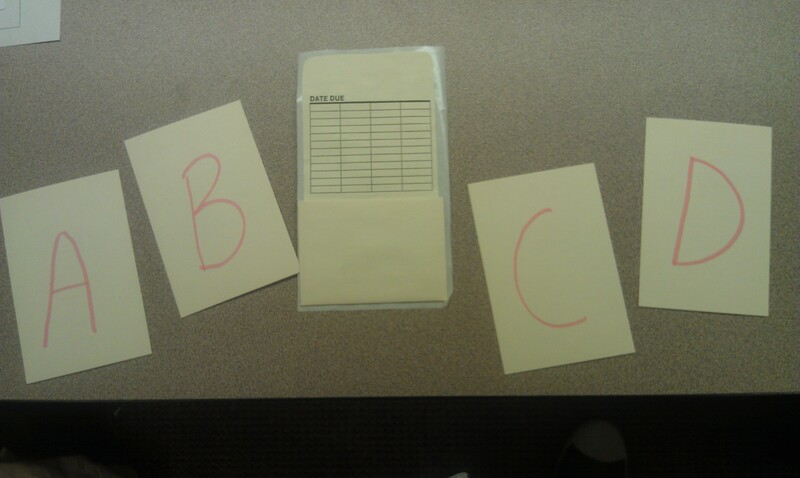 For my first year using Standards Based Grading, I was an SBG-hybrid teacher. The standards that I used made up about 30-40% of students’ overall grades (the category weights changed over the course of the year) and I still included the traditional categories of Tests, Quizzes, Homework etc. This is for two reasons: I was really hesitant to change everything all in one year and I also felt compelled to fit with our departmental grading policy. Next year will probably be the same, almost entirely because of the latter pressure. I got into a little bit of hot water because I didn’t really explain what was doing very clearly at the beginning of the year – anyone else have the same problem? First, I start by placing the breakdown of the points for each question in the second row. This all depends on how you grade tests, but I generally have 6-7 questions on a test that are all broken down into a bunch of individual points for various items like “splitting up the area into a few parts,” “setting up the integral,” “simplifying the expression” and “correct answer.” This forces me to decide beforehand what is important in each problem and how I’m going to grade it. I put little notes above each point for me to remember what each point is for (and again, these force me to award points for specific things rather than a 6/10 for an “almost got it” answer). Then, using a summation (this is important), sum up all of the points into a total for the question and place this under the question number. Then sum up all of the question totals to make the total number of points on the test. Last, using that row you created, fill down as many rows as you need for as many students as you have (plus one row that you can keep at the top to remind you of what each question is worth and the totals). If you use the fill function, the equations that you created in the previous step will stick with you. Now you’re ready for the actual grading process. Pull out a student test and enter that student’s name in the first column next to their row of points. You can either grade page-by-page/question-by-question or student-by-student, but if you do page-by-page (which I prefer) just keep the tests in the same order. Then, when a student misses something, just enter a 0 in the space for that point. So if Bart correctly identified that the y values are needed in a Riemann Sum as the height of the rectangles, but used the wrong x’s to calculate them, you can leave the 1 in the y column but change the column about the x’s to 0. Notice that it automatically totals how many points he earned both for the question and for the whole test. Continue doing this until you have graded all the tests. This is the part that I find makes everything faster. The spreadsheet automatically totals everything so you can concentrate on making helpful remarks on the test instead of totaling points. Okay, so all of that is nice, but wouldn’t be all that worth it considering hand adding works fine (math teachers = good at mental math). But here’s the powerful part – now with one click of a button, you can see how the whole class did on specific parts of specific problems. Just average the responses for a specific question by averaging the column. Then fill the equation all the way from the left to the right covering all the individual parts on each question, the question totals themselves and the test total itself. You automatically have averages for everything now. Now when you go to review, remediate and revisit, you can ignore the green items and focus much more on the reds and oranges. You could even try to judge if the part that NOBODY got right was even a fair question in the first place and use this datum to analyze your assessment. You can also use a lot of other Excel features to quickly or do a lot of things like order the students to see grade distribution, curve your test in creative ways if you do that (or see what a bunch of different curves would do), hide the individual points columns to leave the question totals so you can switch between a macro and micro view, and if you input the students’ names in the same order as your gradebook, you can just copy paste right into your gradebook. I also tend to do a lot of color coding and separate questions by colored bars. This is unnecessary, but makes it easier for me to look at (along with freezing the first column so I can always see the students’ names) Here is my –> example of a completed test grading spreadsheet (same as above). One of my favorite things to do though is to compare my data from the Standards to the data from the test. Comparing my formative assessments and my summative assessments. If the Standards are telling me that 92% of the class is rocking the Quotient Rule, but the test problem indicates that only 45% of people can solve a test problem involving the Quotient Rule, what does that mean? Do I need to alter my standards assessments? Was I lulled into a false sense of security by the high marks so I didn’t bother doing any review, or didn’t bother effectively integrating this concept into later material? Did the question I asked on the test line up with the type of thing I had been asking previously, and should it have? Had I been assessing algorithms previously instead of understanding? Lots of grrrrreat questions it raises for me every time. I save all of these files for the next year. This (theoretically) allows me to focus my curriculum revisions on things that weren’t particularly sticky the first time around, and gives me concrete data to compare different approaches used in different classes (if I use some of the same exam questions). Anyone else do something like this?